On September 14, 1939, the VS-300, the world’s first practical helicopter, took flight at Stratford, Connecticut. Designed by Igor Sikorsky and built by the Vought-Sikorsky Aircraft Division of the United Aircraft Corporation, the helicopter was the first to incorporate a single main rotor and tail rotor design. Piloted by Sikorsky, the September 14 tethered flight lasted just a few seconds. The first free flight took place on May 13, 1940. The innovative 28-foot diameter, three-blade rotor allowed for variable pitch of the blades with a blade speed of 250 to 300 mph. The concepts demonstrated in the VS-300 provided the basis for the first production helicopters and became the standard for helicopter manufacturing across the world. 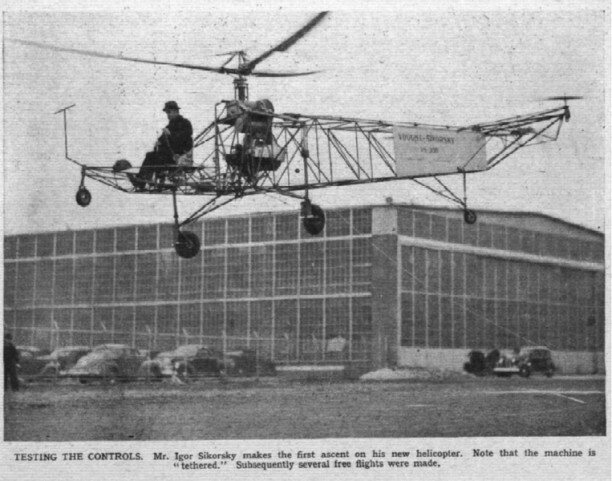 On June 27, 1931, Sikorsky submitted a patent application (no. 1,994,488) for a direct lift aircraft, which included all the major engineering features of the VS-300. The patent was granted on March 19, 1935. Presented to Henry Ford and included in his Edison Museum in Dearborn, Michigan, on October 7, 1943, the VS-300 today remains on display at the Henry Ford Museum.